It’s been over three weeks since I reviewed Part One of Rabbi Resnik’s three-part series. I haven’t had much time to sit down and listen to the audio CD graciously provided by FFOZ but admittedly, I’ve been kind of dreading continuing with the series. Part One was difficult for me to get a handle on, and when I did, I found I didn’t always agree with what R. Resnik said. Part Two was a pleasant departure from that experience, and I found The Ethic of Election to be straightforward, easy to follow, and to be what I expected it to be. It also provided me with some new perspectives on crucial parts of the Torah record and the story of Israel. Resnik began his lecture with sort of a joke, kind of like a story about different siblings get together and find out they all thought that Mom loved them the best, as if each one of them were especially “chosen” or “elect” in relation to their Mom (“But I thought Mom loved me best”). It gets uncomfortable when you think you’re the favorite in the family only to discover that all of your other family members think they’re the favorite, too. But more so, and especially in our egalitarian culture, where in order to avoid any losers having their feelings hurt, we’ve created a society where “everyone’s a winner,” Resnik says it’s a “scandalous idea” that any one person or group could be chosen, because it means other people and groups are not. It’s even worse when God made a choice and that choice of a people was an ethnic group. We don’t like any one ethnic group to be considered more, better, or special than any other group. This came up in a previous blog post some weeks ago when I naively thought Peter must have been addressing a non-Jewish audience using the “chosen” language of Exodus 19, but it was pointed out to me that the apostle could have been as easily addressing Jewish disciples of the Master. That said, Resnik acts as if Peter were addressing Gentiles and he (Rabbi Resnik) was using the verse to highlight the dynamic tension between all Israel being chosen by God and a remnant of the people of the nations also being chosen by God, and their being no contradiction between these two choices. Resnik referenced his previous lecture, particularly the part about conditional and unconditional covenant elements, to highlight that the nature of Israel being chosen is unconditional. Exodus 19:5 makes Israel’s being chosen seem conditional on whether or not they obey the Torah, which is how most Christians read it, but verse 4 tells us that Israel being chosen is totally unconditional. What’s conditional is the role Israel plays and whether or not they will live out that role in a completely realized way, which they can only do if they obey God by observing the conditions of the covenant, the Torah mitzvot. So God doesn’t “unchoose” Israel when they stumble, they just lose key elements in their role, such as living in the Land of Israel, being free vs. being slaves, and so on. Resnik compares God as impartial judge to God as father. We all think we want God to be an impartial judge because that eliminates any preference of a particular population over all the people on earth. But while that may sound like a good idea, it also eliminates a father’s love for his children. Yes, all fathers love all of their children, but truth be told, any father will admit when pressed, that he usually relates better to one of his children than to the others. Do you see where this is going? Relating better to one child does not remove the father’s love from any of the other kids, but because he’s human (this is a metaphor so don’t get too literal on me), he’s naturally going to connect to one kid’s personality more than the others for some reason. This is God the Father in relation to Israel, His chosen one. Christianity, and particularly what we call “Hebrew Roots,” regularly struggles with Israel’s chosen and special status because they think it means “God loves the Jewish people best” and to the exclusion of the Gentiles, but that’s not what Resnik is getting at here. Resnik prefers the second interpretation. It’s not a matter of Israel being chosen and the rest of the nations are out of luck, Israel is chosen for a unique role of service to the rest of the world and to God. It’s one way to understand the two most important commandments, loving God with all your (Israel’s) resources by loving your neighbor (the rest of the world) as yourself. You ever wonder why the story of Joseph takes up so much of the book of Genesis? I never did until Resnik brought it up. The “varicolored tunic” or “coat of many colors” doesn’t have a direct translation from Hebrew into English, but Resnik thinks of it as a “princely robe,” a sign of status, a sign of Joseph’s “election” by his father Jacob. It wasn’t that Jacob didn’t have a right to have a favorite among his sons. I mention above that this is kind of normal for human fathers (and for God). But his mistake, and Joseph’s, was rubbing the noses of the other brothers in it. While the brothers were supposed to support and endorse the election of Joseph, they never accepted it, so much so that when they got a chance, they tried to kill Joseph. But first, they stripped off the sign of his election, ripped it to shreds, dipped it in blood, and threw it at their father’s feet as if to say, “This is what we think of your election of Joseph.” That’s not how it literally played out, but the symbolism is enough to give one pause, especially if we expand the metaphor into the history of the Jewish people in exile and how they have been mistreated and even murdered for the sake of our Gentile/Christian resentment of Israel’s election. They say “the clothes make the man” and Joseph’s life seems to mirror that because his role changes as often as he changes clothes. He’s transformed from a slave into a prisoner when Potipher’s wife grabs his robe after her failed attempt to seduce him, and he is transformed from a prisoner to a prince when Pharaoh, King of Egypt, puts a signet ring on Joseph’s hand, clothes him in garments of fine linen, and puts a gold necklace around his neck (Genesis 41:42). I never thought of Joseph subsequently testing his brothers as a test of whether or not they’d accept Jacob’s election of Benjamin as the favored son. 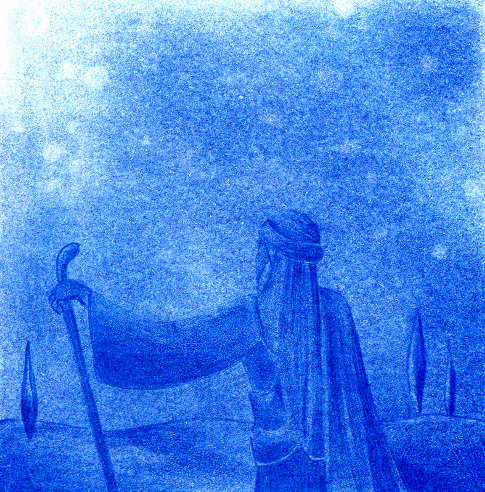 After Joseph’s (perceived) death, all Jacob had left of Rachel was Benjamin. That’s why Jacob didn’t send Benjamin down to Egypt for food with the other brothers and why, when the brothers tell him what Joseph (as the Egyptian prince) did to them in demanding Benjamin’s presence, he resisted sending Benjamin to Egypt for months. In the end, when given gifts of clothing and food by Joseph in Egypt, Benjamin always got bigger and better portions, and Judah passed the test on behalf of his brothers by guaranteeing his safety. There’s an obvious comparison between Joseph and Yeshua (Jesus) in revealing the “mystery of election.” I said before that the clothes make the man, but it’s not just the clothes. Joseph didn’t really come into his own until he was stripped, not once but twice, and when he stopped being arrogant and learned to be a servant, only then were the robes of a King restored to him. Jesus too was stripped and given the robes of a King and a crown (of thorns) but only to mock him. The Romans played at bowing to him, but it was to humiliate him. 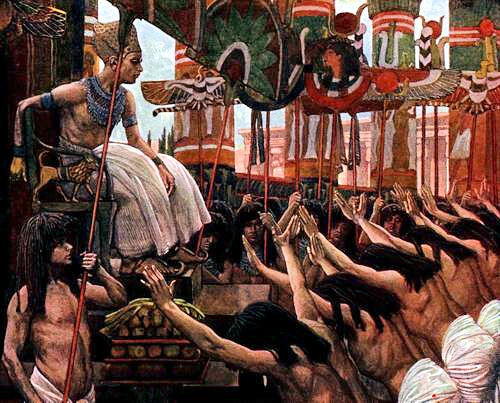 As a teenage boy, Joseph dreamed his brothers and father would bow to him and they resented it, but decades later it became the literal truth. We also know the literal truth that someday, every knee will bow to our King (Romans 14:11, Philippians 2:10). Both Joseph and Jesus were chosen by their fathers, rejected by their brothers, handed over to Gentiles, went down into a pit (of literal death in Jesus’ case), were dressed as Kings (as a form of mocking in Jesus’ case). Yet we know that one day Messiah will come back and assume the throne as our King, as ruler, and as servant. And that’s the secret, that’s the missing ingredient, that’s what it took Joseph many years to learn, and that’s the secret of Israel’s election as well. When the chosen Israel is obedient to God and of service to the world, she prospers in her “servant’s apron,” chosen of God on behalf of the nations of the earth. She is special and she wears the robes indicating their status, not as rulers but as especially responsible to God and to the world. When she’s disobedient, she is not “unchosen,” but like Joseph, she experiences “reversals” such as being slaves or prisoners, and Israel’s history is replete with such experiences. When she sees the robes of her election as a status symbol, they become twisted around her, trapping her. When she understands their true nature, she is free, free to serve God and to realize her role in the world. R. Resnik didn’t take it this far, though I suspect he might in his third and final lecture, but let’s see if I can anticipate him a little. As we saw in Joseph’s example, simply dressing up in a “princely robe” doesn’t make you a prince. If you’re a spoiled brat before putting on the robe, you’ll be a spoiled brat after you put it on, too. If you think you are deserving, special, and it’s your right to have that robe, then you risk having it stripped from you and worse. I quote these verses with some regularity and with good reason. There are plenty of well-meaning non-Jewish believers who are authentically convinced that they are equally chosen along with all Israel and that they deserve to wear the princely robe along with them. Problem is, they see it as a status symbol, sort of like the BMW of robes, rather than the clothing of servants who are expected to “go the extra mile,” so to speak, in the service of the world and of service to God. It was God who gave, among the other Torah mitzvot, the commandment of the tzitzit to Israel. 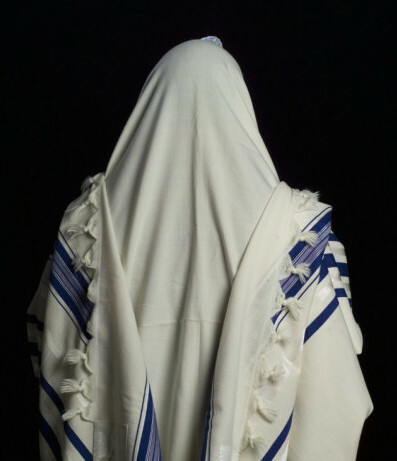 One might think of a tallit as Joseph’s “princely robe,” but then again, the Shabbat, which is the actual sign of the Sinai covenant, kosher, the festivals, they all could be considered as those robes of servanthood. Joseph eventually revealed his true identity to his brothers and his father and they were all brought down to Egypt and given land on which to live. Pharaoh was excited to hear that Joseph had brothers. If one Joseph could save Egypt and the rest of the civilized world from famine, think what a dozen “Josephs” could do. But they never did. None of Joseph’s brothers were elevated to a position anywhere near what Joseph had achieved. None of them became “princes in Egypt” or anywhere else. Joseph was Jacob’s elect and he served and ruled until his dying day. His brothers were pale shadows by comparison. Yes, Jacob loved all his sons, but he rightly recognized that Joseph was special and chose him accordingly as was his right. God chose Israel as is His right, not because of any quality Israel possessed, but simply because it was God’s desire to do so. He doesn’t have to have a reason, at least one we understand. Joseph was chosen on a larger scale to save his family (Israel) and the rest of the world from famine and he did it. Jesus was also chosen by his Father to save Israel and the rest of the world, and in one sense, it was accomplished on the cross. But in a larger sense, the process is still ongoing and won’t be complete until he returns. Israel, national Israel and all the Jewish people, are chosen to prepare the world for the redemption of their nation and through them, the entire world. If we, like Joseph’s brothers, choose to reject that election, and metaphorically speaking, rip up Israel’s robes (or Messiah’s), dip them in blood, and throw the gory mess at the feet of God (and how often has that already happened? ), we will also suffer as the brothers did. We’ll still be part of the family, but we will forfeit much of our special role in the service of God. You cannot say you love God if you hate Israel and the Jewish people and covet their princely robe. You also can’t simply crawl under the robe with Joseph like a small child of yesteryear would crawl under his mother’s skirts. I don’t know if this is anywhere near where Resnik is going, but it’s what came to mind as I was listening to the lecture. If Bible scholars can’t be expected to agree all the time about the message of the Bible, at least in the details, how much more so can we expect some disagreement between different groups of believers in relation to observing mitzvoth and the distinctive differences between Jewish and Gentile disciples of the Master? Perhaps I oversimplify this issue in my own thoughts, but I am continually confused as to why the issue of “oneness not sameness” is made so complicated. Within the Christian community we see the concept of people groups without any challenge. Pastors are held in higher regard than the congregation. Missionaries are held in higher regard than home church attenders. Even within the pastor or missionary world, there is a hierarchy. Stadium preachers, TV pastors, book writers, or mega church leaders are typically are held in higher regard than the common pastor. I’m not agreeing or saying this is right or wrong, I’m just pointing out the differences. Within the Christian world this is referred to as someone’s calling. Even within the Jewish community dating back to the 40 years of wandering, God set up a hierarchy within His chosen people. The Levites were set apart as priests and thus effectively chosen as a more important small group within the larger group. The responsibility given to the Levites did not make the other 11 tribes second class citizens any more so than being a Gentile believer makes us second class citizens in God’s eyes. It just defines our different roles and responsibilities. I just finished reading The Heart of a People (http://www.amazon.com/Heart-People-Moshe-Avraham-Kempinski/dp/9659107706#) in which Moshe Kempinski works to explain the differences between Jew and Christian from a Jewish perspective, while not being disrespectful to either group. As best as I can tell, owning a book store in old Jerusalem and having Christians regularly come in to evangelize motivated him to write a few books on the subject of difference. One of the ideas he conveyed in this book is that a traditional Jew, with the right heart, does not see the Jewish people as better than the Christian people. The Jewish people consider that they have a different role and responsibility with in the realm of this world and into the new kingdom. As far as he is concerned, we’re both striving with the right hearts, toward the same God, but the “how we go about getting there” is what differentiates us. D. Lancaster said in a sermon I listened to recently, that he doesn’t believe we will be judged on our doctrinal differences, but how we treated other people. I do not recall which sermon this was, but it was within the last couple of month worth of podcasts. This seems to correspond to your final thoughts, James, regarding the acceptance of our differences. D. Lancaster said in a sermon I listened to recently, that he doesn’t believe we will be judged on our doctrinal differences, but how we treated other people. As far as why it’s so hard to “get” that Israel is elected and has a special role on behalf of all humanity, I think it has to do with what Resnik said about our egalitarian society being taken to such extremes. People are so worried about “self-esteem” that no one can be special or different anymore. We must all be absolutely the same, or someone starts throwing a fit. Once you let go of that attitude and along with it, self-importance, the realization of Israel’s election comes easily. 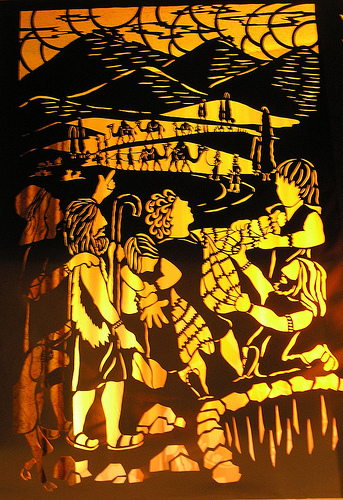 I found the use of Joseph’s role as a metaphor for Israel to be most illuminating.